Beginning in 1993, the Beach Watch project was one of the first citizen-science monitoring projects within NOAA. In 2016, over 150 highly trained, citizen-scientists conduct bi-monthly shoreline surveys year-round. These volunteers collect data on live and dead species of birds and marine mammals to determine severity, extent and duration of mortality events. Volunteers also collect data on human activities that can result in wildlife disturbance to live birds and mammals. They also report violations, detect oil pollution, and collect oil samples. This information provides a baseline dataset on the presence of live and dead coastal wildlife and human activities and can be used to link wildlife health to pollution, climate change, prey availability, or other environmental factors. 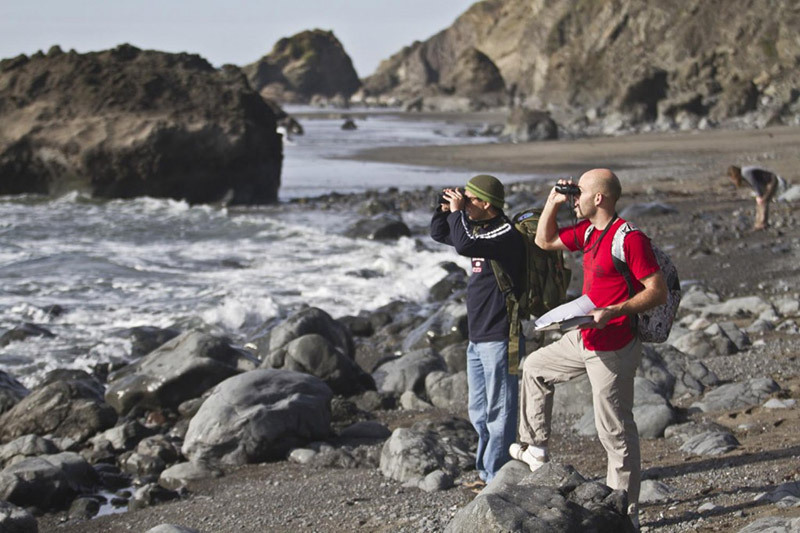 Currently, over 1,300 surveys are performed annually, spanning 280 km of coastline from northern to central California. The Beach Watch project is the epitome of a strong citizen science program, which provides early detection of natural and human-caused environmental events that could threaten the health of our coastline. Project findings also provide information for resource managers and promote environmental stewardship, thereby increasing protection of our oceans. 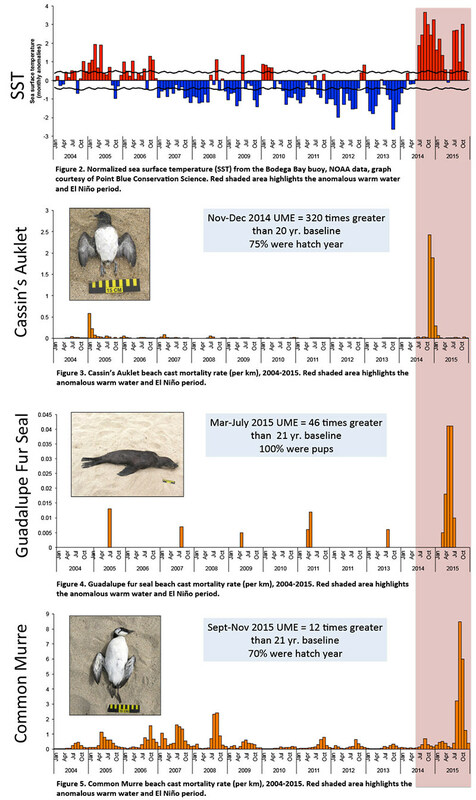 In 2014 and 2015 Beach Watch surveys documented unusual mortality events in two seabird species, Cassin’s Auklets (Ptychoramphus aleuticus) and Common Murres (Uria aalge), and one pinniped species, the threatened Guadalupe Fur Seal (Arctocephalus townsendi). Cassin’s Auklets, a pelagic species, are historically rarely observed in beached bird surveys in north-central California, typically found at a rate of 0.017 birds/km surveyed. But, from July 2014 through February 2015 these seabirds began washing ashore on beaches between Northern California and Alaska in record numbers. During November and December 2014 Cassin’s Auklets were observed at a rate of 2.82 birds/km, which is an increase of over 166 times above baseline rates. Similarly, Guadalupe fur seals are uncommon in the north-central coast of California and are rarely found in beach surveys, typically found at a rate of 0.0002 mammals/km. In March through July 2015 Guadalupe Fur Seals were documented at a rate of 0.025 mammals/km, which is an increase of 124 times above baseline rates. Common Murres are the most common species of beach cast bird documented in Beach Watch surveys, typically at a rate of 0.28 birds/km. From September through November 2015 Common Murres were documented at a rate of 5.95 birds/km, which is an increase of over 20 times above baseline rates. 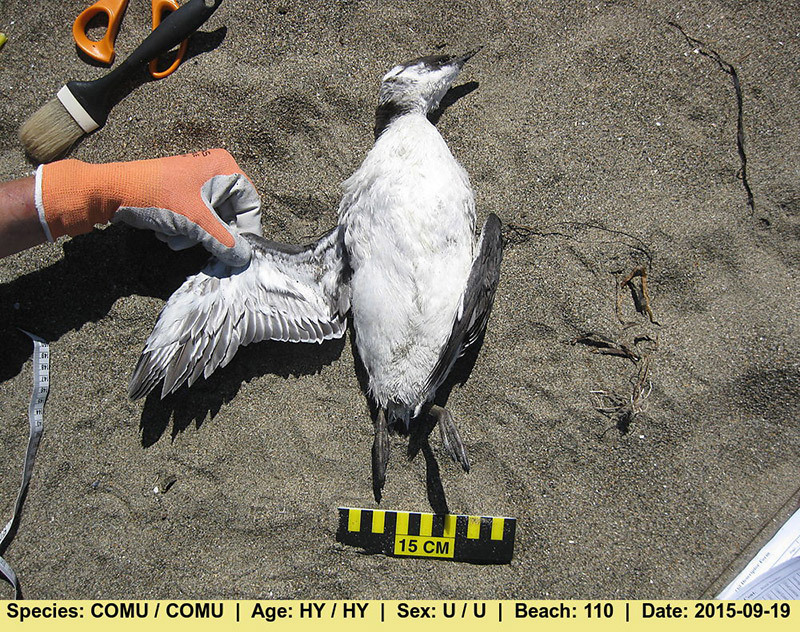 In September 2015 alone, Beach Watch surveyors found 1,500 Common Murre carcasses – six times the average, and four times the average during an El Niño, when more Murres die. It was determined that most of the dead birds and fur seals died of starvation. 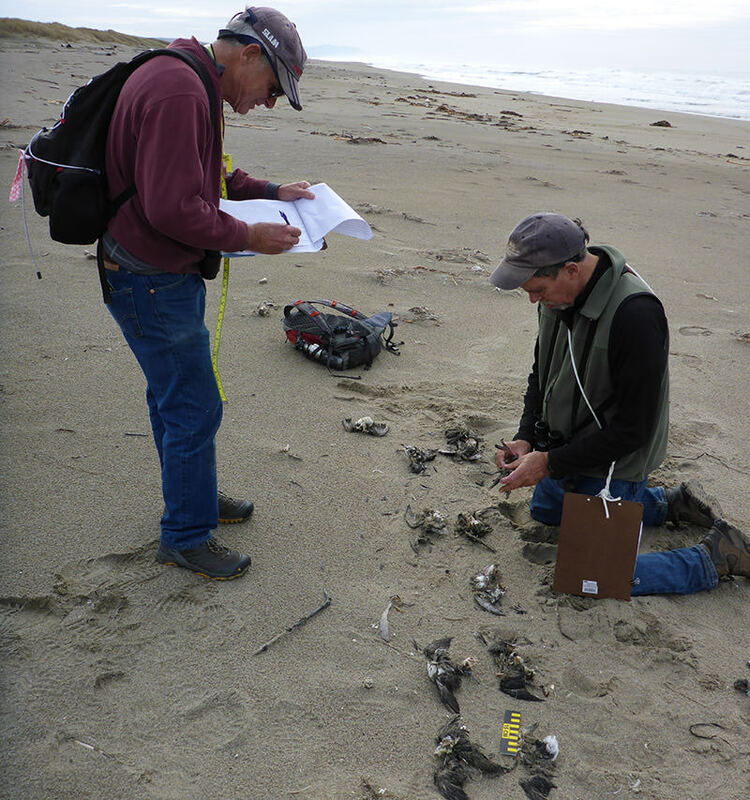 In fact, most of the seabirds Beach Watch volunteers have found are “feather and bone” as noted by Kirsten Lindquist, manager of the Beach Watch project. During these mortality events, a prolonged period of unusually high sea surface temperature occurred, including the “Warm Water Blob” – unusually warm surface water temperatures (up to a depth of about 100 feet) that had dominated three areas of the North Pacific: the Bering Sea, Gulf of Alaska and an area off Southern California, and the on-set of El Niño in the fall of 2015. These conditions have resulted in sea surface water temperatures several degrees higher than normal. Warmer water conditions can have a cascading impact on environmental conditions. To begin, warm water is less nutrient-rich than upwelled cold water. Species that thrive in warmer conditions may experience increased growth, survival and abundance. However, species that favor colder water conditions may suffer reduced growth, poor reproductive success, starvation and population declines. It is thought that the unusual warmer surface water temperatures have affected prey availability at multiple trophic levels (e.g., zooplankton and fish) by lowering productivity and changing the distribution of prey species. For example, it is thought that many fish prey species may be distributing themselves into deeper, cold ocean depths, too deep for seabirds to reach or migrated north away from the traditional feeding areas. The warm water conditions lead to the development of a West Coast wide harmful algal bloom, signs of which were found in Common Murres and California sea lions, as well as delaying for several months the opening of Dungeness crab fishing season. The Beach Watch project will continue to serve as an important ecosystem health sentinel monitoring program as we move forward to further understand the effect of warm surface water temperatures.